There’s always a certain amount of trepidation when a filmmaker like Wes Anderson, known for making intimate and personal films, starts making movies on a more ambitious scale – bigger budgets and movie stars in an attempt to appeal to larger audience – that he will lose all of the qualities that made his movies so interesting in the first place. Easily his most accomplished film, The Life Aquatic with Steve Zissou (2004) merges his stylized dialogue and quirky characters with elaborate sets and action set pieces in an exotic locale. After his best friend is eaten by a Jaguar shark, famed oceanographer Steve Zissou (Murray) vows revenge. The problem is that the fish is endangered and he’s having trouble raising money for the expedition. He also meets Ned Plimpton (Wilson) who may be his son by a woman he met 30 years ago. So, he convinces the young man to join his expedition in an attempt to make up for three decades of neglect. Ever since Bottle Rocket (1996), Anderson’s movies feature a water motif in some form or another, whether it is Anthony and Inez’s first kiss in a swimming pool in Bottle Rocket or Max Fischer’s desire to build an aquarium in Rushmore (1998). With Life Aquatic, Anderson finally realizes his fascination with water head on by crafting an homage to Jacques Cousteau. Life Aquatic also continues Anderson’s thematic pre-occupation with flawed father figures and their sons. There is the burnt out Mr. Blume and Max in Rushmore and Royal and his children in The Royal Tenenbaums (2001). In Life Aquatic, Steve tries to reconnect with Ned in the hopes that they will bond while hunting for the Jaguar shark. Like Blume and Royal, the world seems to have forgotten about Steve. He’s washed up and hit rock bottom now that his best friend has been killed. The film also continues Anderson’s structuring of his movies into segments. In Rushmore, the story was broken down into months serving as acts in a play, with Tenenbaums, it was chapters as in a book and now with Life Aquatic it is days as Steve’s mission is being filmed for a new documentary. This structure reinforces the magical, almost-fairy tale feeling that Anderson creates in every one of his films by drawing attention to itself as a fanciful tale. Bill Murray turns in another excellent, low-key performance as the melancholy Zissou. With his beard and gruff, macho attitude, Steve comes across as a Hemingway-esque figure with a dash of Cousteau. And yet, no matter how extravagant things get, Murray always keeps things grounded with his sparse performance. Over the course of his career, the comedian has been gradually refining his style of acting. He gained fame in broad comedies like Stripes (1981) and Ghostbusters (1984) but has fine tuned his style to a less-is-more approach with movies like Rushmore and Lost in Translation (2003). His turn in Life Aquatic is just the right blend of comedy and pathos. Most films don’t warrant much thought or discussion, but Anderson gets more and more interesting with each new effort. They are filled with so many fascinating little details crammed in each and every frame, repeated thematic motifs and minor characters who often wander in and out of the background of scenes. His movies are magical, existing in their own unique worlds and bursting with ideas that are almost too much to absorb in one sitting. As was the allure of David Lynch’s short-lived T.V. show, Twin Peaks, one of the appeals of Anderson’s films is that we want to be in these quirky worlds he creates and we want to know his characters. We want to lose ourselves in his universe and the beauty of DVD is that they allow us to revisit the worlds of his movies any time we want. Anderson is not only more ambitious in terms of structure and scale but also with the visuals of Life Aquatic. Shot in Italy, he utilizes the striking landscape of the country for a sun-kissed warm color scheme of yellows and browns. There are also the striking images that linger long after the film ends: the glowing jellyfish on a beach at night and the stop-motion animated fish (by Nightmare Before Christmas’ Henry Selick) and portrays them so vividly and in an exciting way. Anderson’s career has been building up to this film. With The Royal Tenenbaums, he was able to juggle a large cast of name stars while still maintaining his artistic integrity. With Life Aquatic, he continues to use stars but has upped the ante in production values and scope. However, he has not lost the intimate feeling that all of his movies possess. No matter how ambitious or big the scale, his films have hand-crafted feel to them. One gets the feeling that Anderson cares about every detail an every aspect and it is this personal touch that makes his movies so unique. The vibrant color scheme of Life Aquatic absolutely shines on this stunning Blu-Ray transfer. The filmic texture is intact and there is an incredible amount of detail, crucial to Anderson’s films, which are jam-packed with fine details. There are nine deleted scenes that feature some nice little bits of business between characters. There is nothing too significant for the most part and these were rightly cut out. Also included is an audio commentary by Wes Anderson and co-screenwriter Noah Baumbach recorded at the restaurant in New York City where they worked on the screenplay. For Anderson, this film was a way to voice his views on filmmaking. He also talks about working with Bill Murray and how the actor understands what we wants. He also talks about how Murray is able to instantly command a room and affect people. This is an engaging and thoughtful track as the two men touch upon the film’s themes in an unpretentious way. “Starz on the Set” is a 14-minute featurette. Ever since Rushmore, Anderson has wanted to make this movie with Murray. It is fairly standard press kit material as Anderson and the cast talk about the film’s plot and their characters with lots of clips. The second disc features a collection of stills taken during filming. 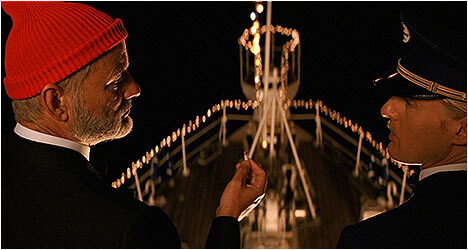 “The Look Aquatic” is a brief look at how the specific world that Anderson wanted to depict in his film was achieved, including the large set of the cross-section of the Zissou’s ship, the Belafonte. In “Creating a Scene,” the cast talk about Anderson’s style of filmmaking and how they contribute to it. There is an excellent interview with long-time Anderson composer, Mark Mothersbaugh. He started composing music for Life Aquatic while Anderson and Baumbach were still writing the script. Mothersbaugh talks about his transition from Devo to scoring movies and T.V. shows (his first gig was Pee-Wee’s Playhouse) and gives insight into his creative process. “Mondo Monda” is an amusing parody of an Italian talk show hosted by Antonio Monda who interviews Anderson and Baumbach in Italian while the two men struggle to understand what he’s saying. “Seu Jorge Performs David Bowie” features footage of the Brazilian recording artist performing ten Bowie songs in their entirety in Portuguese on the set of the film. Some were used in the film. “Aquatic Life” is a fascinating look at how the undersea creatures were made via stop-motion animation by Henry Selick and his team and then inserted into the movie via computer. The “Esteban” featurette follows Seymour Cassel around in Italy as he buys some cigars, talks about John Cassavetes and his films and we see him being directed by Anderson on the underwater set of The Life Aquatic. The centerpiece of the supplemental material is “This is an Adventure,” a 51-minute documentary made by Albert Maysles, Antonio Ferrera and Matthew Prinzing during filming in 2003. It takes a fly-on-the-wall approach and illustrates, first hand, the natural charisma that Murray exudes even during a wardrobe fitting that puts everyone around him completely at ease. We get to see various scenes being shot in this absorbing doc. “Intern Video Journal” is a behind-the-scenes featurette shot and edited by “Intern #1” Matthew Gray Gubler. He recounts his experiences on set which he describes like being “in summer camp.” He also documents what the cast and crew do between takes – sleeping, playing foosball and basically messing around to alleviate the boredom. There is also a gallery of paintings of the characters, logos and posters that were featured in the movie. “Ned” is a brief interview with Owen Wilson as he talks about his character. Also included is a look at the costumes designed for the film. Finally, there is a brief look at Cate Blanchett’s character with the actress talking about how she incorporated her real-life pregnancy in the role.